DIMO is a plant dispersal model that shows how plant species may move across regions when growing conditions change, for example, due to climate change. It can be used for analysis of spatial connectivity and for land use planning. The tool is for skilled modellers who want to cooperate with Alterra. Alterra can run the model for nature policy managers. DIMO simulates plant dispersal in time, given (abiotic) suitability and species-specific characteristics. As a result it gives the potential plant species distribution e.g. due to habitat changes. The model is run per species for a defined area, which may vary from regional till European scale. DIMO needs several input maps, a habitat suitability map, a map of seedbank characteristics (showing where seeds are present at the start of the run; may be blank) and a barrier map (limiting animal dispersal). Furthermore parameter values are used to define the dispersal distance per dispersal type, for germination delay and for seed bank lifespan. A run for Europe on a 1*1 km grid basis for 100 years may take several days, a run on a regional scale several minutes till hours. 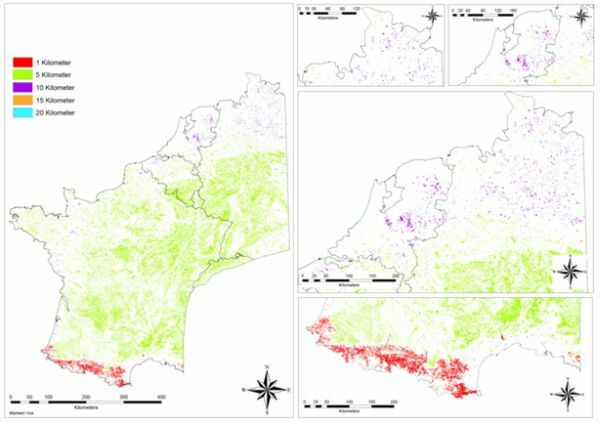 Dispersal of a fictive plant species with five different dispersal distance capacities from the South of France through forests. The species can only use forest habitat. If the dispersal capacity is 5 km the species is, in time, able to travel halfway into Germany and into parts of the Netherlands. When its dispersal capacity is 10 km it can reach almost all forests in the North of both countries as well. Barriers for the dispersal are none-forest habitats, such as agricultural fields and cities. The model has been applied for the Netherlands and South-west Europe. The model can be applied from nature conservation area level till European level. The time step is one year and normally the model will be run from 50 to 1000 years (forest). Free, via the contact persons. 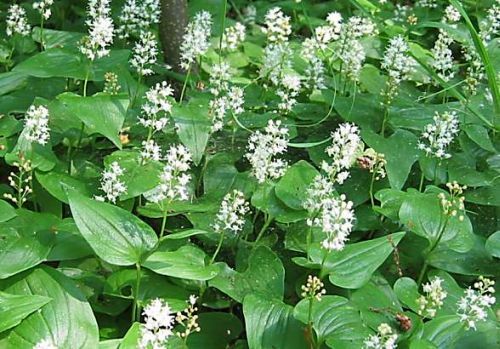 Movie of dispersal of Maianthemum bifolium (May lily) in the Netherlands.